Victoria's Dockside Lands and Inner Harbour are prime redevelopment locations. The Greater Victoria Regional District is currently experiencing unprecedented growth. Nowhere is this more evident than in the City of Victoria. It is predicted that by 2020, Victoria's downtown will have a resident population of approximately 30,000 people living within a 1.2 square mile radius of city hall. That means an average of roughly 1,300 new residents per year for the next 16 years. It's easy to understand why this growth is happening. The combination of unique old-world charm, a temperate climate and an established reputation as an internationally acclaimed tourist destination, not to mention its status as the provincial capital and the heart of Vancouver Island's business community, all make Victoria a location of choice. The question now, however, is whether forces within the city that fear movement away from the status quo will derail its healthy evolution into a modern urban centre. To meet growing consumer demand, developers are intermingling a host of modern condominium projects alongside more traditional heritage-building redevelopments. Bearing names like Corazon, Astoria and Shoal Point, these stylish high-rises add a distinctly modern flair to what has often been regarded as a quaint urban core. So far, the sale of condominium projects has surpassed even the most optimistic projections. As a result, there are 406 condominium units under construction in the city - nearly double the number under construction at the same time last year. This trend is not expected to cool in the near future. If the development community has its way, Victoria will soon be positioned as one of the top three residential investment locations in the Pacific Northwest. One area earmarked for redevelopment is the city-owned, Dockside Lands. This large waterfront parcel, formerly an industrial land site, is in desperate need of remediation and redevelopment. Developers are submitting bids to acquire the rights to redevelop it, and current proposals include everything from light industrial uses to commercial enclaves and multifamily residences. Although final development decisions have not been made, city officials view the area as integral, the city's future and are looking at each prospective project with due diligence. 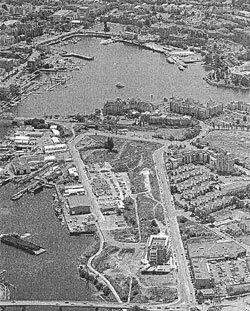 Redevelopment is also expected in Victoria's Inner Harbour. This high-profile area - the one most popular with tourists - currently has more than 100 acres of underutilized land, home to various government projects, industrial yards, parking lots and ferry terminals. What stands in the way, however, is a reputation that Victoria has earned over time as a municipality that is somewhat unfriendly to developers. Difficulty obtaining rezonings and permits can't be overlooked by developers when weighing the the city against neighbouring West Shore communities that offer more welcoming conditions. Of particular concern is that attempts by developers to deliver higher density housing alternatives have been met with resistance from Victoria city council, as well as residents of affected communities. Densification is crucial: Given current land prices and development costs, this is the only way many projects make economic sense to lenders, investors and the developers themselves. Moreover, densification would also help balance growth between Victoria and the suburbs, easing traffic congestion and ultimately making for a more livable region. Often, the mere mention of denser development fuels an uproar from a vocal opposition dead-set against tall buildings they worry will disrupt the Victoria they know and love. But such structures, despite all the handwringing, often result in additional green space and view-corridor opportunities. Moreover, density does not necessarily imply height -- consideration could also be given to more site coverage as an alternative, if that's what the community preferred. Unfortunately, elected officials often feel compelled to act upon the more knee-jerk concerns. Because municipal councilors in Greater Victoria are frequently elected with very small pluralities, they worry about losing even a few votes within their constituencies. The result is political stances that are sometimes in the best interests of an individual's short-term political fortunes, but not the city's long-term future. To prevent this from happening, decision-makers must be better informed and actively engaged in the development process. Toward that end, groups such as the Downtown Victoria Community Alliance (DVCA) have begun to work closely with civic officials and other stakeholders to develop a vision and create a long-term plan to help stimulate planned growth within the city's core. The collective efforts of civic officials and these stakeholders working together should go a long way toward improving the area's reputation amongst members of the development community. Victoria, of Colliers Macaulay Nicolls.